Ever since I learned about it, the phenomenon of mutualism has fascinated me (see here, here, here, here, here, here, here, here, and here). If you aren’t familiar with the term, it refers to a situation in which two or more organisms of different species work together so that each receives a benefit. One of the most common examples of this kind of relationship is found among fungi and plants (see here and here). The fungi (called mycorrhiza) extract nutrients from the plants, but in exchange, they provide the plants with critical nitrogen- and phosphorus-based chemicals that the plants have a hard time extracting from the soil. As a result of this relationship, both the plants and the fungi thrive. It is not surprising, then, that the vast majority of plants in nature form relationships with mycorrhiza. Swiss researchers were recently studying trees in a forest, and they learned something rather surprising about these mycorrhiza. They facilitate the exchange of nutrients between different trees in a forest, even trees of different species!1 Why is this so surprising? Well, it is thought that trees in a forest are in constant competition with one another. They compete to expose their leaves to the sunlight so they can produce more food via photosynthesis. They compete for the nitrogen- and phosphorus-based chemicals that they must absorb from the surrounding soil. They even compete for the water in the soil. Despite this perceived competition, however, there seems to be at least some cooperation as well. How did the researchers discover this surprising fact? They used a crane and several specialized tubes to expose the leaves near the top of some Norway spruce trees to carbon dioxide that had much less carbon-13 in it than the carbon dioxide naturally found in the air. Most of the carbon in naturally-occurring carbon dioxide is carbon-12, but there is a small amount of carbon-13 in it as well. Carbon-13 is just as stable as carbon-12, and it is also chemically identical to carbon-12. However, it is heavier than carbon-12, which allows scientists to distinguish between the two. 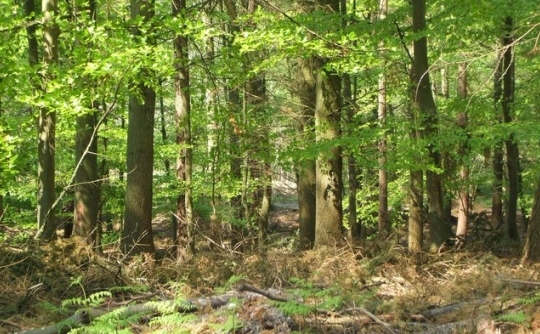 After exposing the trees to the special, carbon-13-depleted carbon dioxide, the researchers analyzed the carbon found in various parts of the exposed trees, the surrounding unexposed trees, and the different species of plants and fungi on the forest floor. They found that they were able to trace the products of this special carbon dioxide, and it showed up in very specific places. around the exposed trees to the same plants that were on the forest floor far from the exposed trees. They found no difference in the amount of carbon-13 in those plants. This told them that the special carbon dioxide they were using didn’t contaminate the forest floor. However, when they examined the roots of the exposed trees, they found products of photosynthesis that had depleted carbon-13 in them. That means the leaves had absorbed the special carbon dioxide, used it in photosynthesis, and transported the products to the trees’ roots. That’s not surprising, of course, since the products of photosynthesis are transported throughout a tree. The surprising part was when they examined unexposed trees that were near the exposed trees. While they found no significant amount of depleted carbon-13 in the branches of those trees, they did find a significant amount of depleted carbon-13 in the roots of those trees. In other words, the leaves of the unexposed trees didn’t accidentally get exposed to the special carbon dioxide, but photosynthesis products from that special carbon dioxide were found in their roots! How in the world did the photosynthesis products from the special carbon dioxide end up in the trees that weren’t exposed to it? To answer that question, the researchers examined the carbon in the fungi that exist below the forest’s soil. They found that while the non-mycorrhizal fungi didn’t have carbon from the special carbon dioxide in them, the mycorrhizal fungi did! That means the mycorrhiza transferred the photosynthesis products of the exposed trees to the roots of the unexposed trees! In addition, the researchers found that these photosynthesis products even ended up in trees that were of a different species than the exposed trees! An increasing number of studies show that belowground ecosystems are highly complex and diverse. Klein et al.‘s study adds a new dimension to this, revealing that substantial amounts of carbon can move from one tree root system to another. Obviously, we have a lot more to learn about this process, but the very fact that it exists adds an entirely new network to the phenomenon of mutualism. The more we study the creation, the more awe I have for its Creator! How Christianity and Science Can Interact Bill Nye Couldn’t Be More Wrong!